After a long week of work, I walk to my car and notice something is wrong, I couldn’t see the car light turn off when I unlock the car. After I put key in to start the car, I didn’t start. The first thought that went through my mind was, I forgot to close the door completely and the car wouldn’t start. Normally, I’d call my insurance company with the road side assistant that they charge an extra $80, I ditched that after I switched my old car insurance. My other option was to call Mr.WRI up who happened to work for the same hospital and pulled him out of whatever important board meetings that he’s obligated to be there to rescue me. But I didn’t. I’ve been single (never married) for all my life, I wouldn’t make it this far if I had to rely on a man/partner every time my car broke down or any other small problem or issue I run into. Well, my hospital offered some exellent services, including the *school*Walk, or *school*police, and there were 4 phones on each level. I called, and the dispatcher send a nice young men with a battery power cable jumper. (I also had one at home which I don’t need anymore every since I got rid of my old Honda Civic). I drove around town for two hours, hoping it would recharge the battery. The next morning, it still had a weak start. 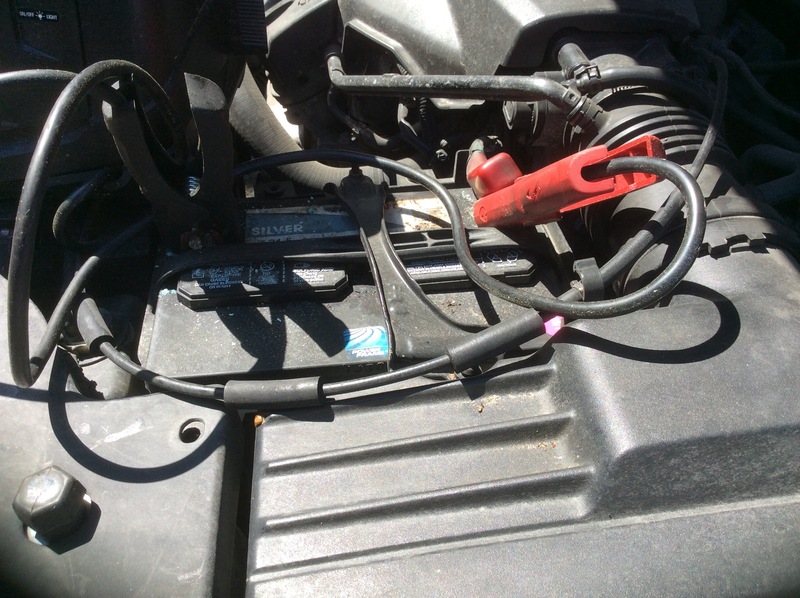 Two days later, I still couldn’t start the car without the help of the battery power cable jumper. It was time for a new battery. **You could go to a mechanic and they can test if your battery is salvageable, but I’ve changed at least three batteries in my cars before, if a battery can’t hold charge, don’t waste time and energy to recharge and risk getting stuck somewhere. I hate Sears. I don’t have Costco membership. I could borrow from a friend but I don’t want to bother anybody. Clearly Walmart is the winner as advance auto part and Napa only replace the battery if one of their guys knows how to do it. Walmart includes that in their service, it took two minutes. As a proud owner of 1xx shares of Walmart, I’m happy to spend it at my own company. 🙂 it’s a Monday afternoon, I’m happy to report that the store was packed, and the car services is doing well. If you happen to have a luxury car with the anti-thief system, the radio will require a code after you change the battery. I still have the book with the code (if not you call the dealership, they’d give it to you after a bunch of command you can do on your radio), YouTube the instruction, and the radio works like a charm. Two car rentals – she claims she doesn’t know anything about car, if anything happen, the car company will take care of everything. They drive big SUVs (hey, they are both have doctoral degree, their rides need to match their status, no reason to live like a college student when you gross 6-figures) . Rent a 2-bedroom in the prime real estate area with shopping and restaurant are near. (While they could rent a 1-2 bedroom in town for 1/2 price. You bet that eat out everyday spending at least $30/day on eating out food, not mentioning about grocery. Their massive $400k in student loan, you bet that if they weren’t frugal in college, imagine what they’d do when they make 6-figure income. Their family come to visit, to provide the maximum privacy, they provide nearby hotel room! What?! They didn’t max out 401k, so they budget everything off of the take home income, not after savings. Take 1-2 international or domestic vacation a year. This is someone who likes to travel to stay at an all inclusive resort. ((I don’t like to stay at these resort and got stuck at the same restaurants, and I don’t drink alcohol or carbonated beverages, more calories and bad for health)). Not counting on cost of having kids. She very much think “car” is a man thing. If her husband is too busy for it, she has no business trying to battle with it. The road to freedom isn’t always easy, if I rely on a man/partner to carry 100% of my we it, I wouldn’t be here today. School provided me with one of the most powerful tool, the ability to learn independently, the ability to continue to further my education without being in a traditional classroom. That, my friend, is how you tackle obstacles in real life. In short, life events happen all the time, good and bad. You should always have a mentality of you can deal with it. Look for free resource that’s readily available to you – in my case was the university police, I could get another car with a jumper. If you are going to get the part, take a couple of minute to look for the best deal possible. It’s your money. Always see the glass as half-ful, stay positive and treat the event as a learning opportunity. It’s a part of the growing ip process. Full disclosure: I’m long WMT. Wal-mart is where I buy my batteries. Their batteries come with a really good, no questions asked warranty. Thanks for sharing. Last time around I was really surprised the dealer was running a special that blew the doors off the other battery choices. I’m usually a retail shade tree mechanic. Shopping around when buying stuff is a good practice. I helps you save a decent amount. It’s definitely worth having a look at the best value (not necessarily price) you can get. If our car were ever to have problems, we’d probably just take it to the mechanic and let them deal with it. Interesting about your friend, it’s surprising how people who earn so much can have such poor finances.